Siri can make appointments, tell you the weather, but now she can start your car as well! After we showed you how Siri could be hacked to use a custom proxy and execute custom commands, we knew it wouldn’t be long before additional hacks would start rolling in. [Brandon Fiquett] thought it would be great if Siri could remotely control his car, so he built this functionality into Siri using [Pete’s] proxy software. The hack relies on the Viper remote start system he had installed in his car, along with a few modules loaded into his proxy server. His proxy server tweaks allow Siri to interpret a preset list of commands such as “Vehicle Start” and “Vehicle Arm/Disarm”, relaying the commands to the Viper SmartStart module. We imagine that the back-end functionality is not unlike the existing SmartStart iOS app, but it looks like [Brandon] beat Viper to the game since Siri has not been made available to 3rd party developers as of yet. Check out the video below to see Siri in action, then be sure to swing by his web site for additional videos as well as the code that makes this possible. pretty cool, works like a charm from what we can see here. Is there a wireless web client inside his car, or is it at home connected to the other (spare) remote controller, or what? yea…lots of smoke and mirrors. smoke and mirrors that are pretty much COTS and probably expensive. wheres the hack in that? For those SIRI hacks you need to connect to your own wifi and reroute the requests to the apple server to your own proxi. i guess he got a car pc with wifi. All of those SIRI hacks so far are nothing for the mass market due to the requirement of a proxi server. However those a real hacks, as in using devices in new ways that have not been enabled by the manufacturer. They try out ideas and show in reality. I think it’s awesome and inspiring even though i would never want my car, tv or light controlled by voice. $400 is a little steep. Seems kinda redundant to have a remote device to connect to another remote device to start a car in a nearby area. Still kinda cool to use Siri though. I don’t quite think that’s how this hack actually works. 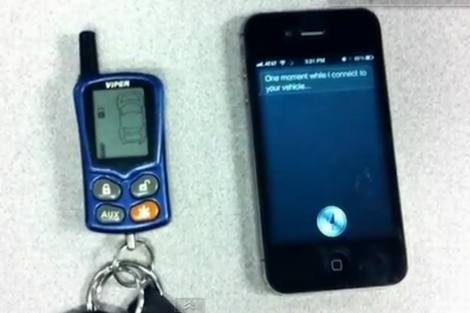 From what I can gather (and I may be wrong), the Viper fob is present in the video just to show the status of the vehicle, not to relay the signals from the iPhone to the car. Viper already makes an iPhone app for their SmartStart remote starter module, which I believe works over WiFi. He has been able to reproduce whatever commands the app sends to the car using Siri, without requiring Viper’s application. At least that’s how we took it.